#1 What’s breaking into a bank compared with founding a bank? #2 Do not fear death so much but rather the inadequate life. #3 It is easier to rob by setting up a bank than by holding up a bank clerk. #4 To live means to finesse the processes to which one is subjugated. #5 No one can be good for long if goodness is not in demand. #6 Society cannot share a common communication system so long as it is split into warring factions. #7 From the cradle to the coffin underwear comes first. #8 Mixing one’s wines may be a mistake, but old and new wisdom mix admirably. #9 Hungry man, reach for the book: it is a weapon. #10 The law was made for one thing alone, for the exploitation of those who don’t understand it, or are prevented by naked misery from obeying it. Science knows only one commandment – contribute to science. 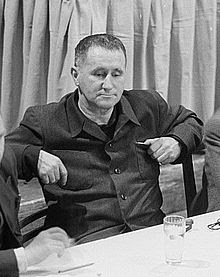 So these were the top 10 best Bertolt Brecht quotes. Do share them and keep reading!